We didn’t do anything for Easter this year, nor did I make anything special (granted, we did eat plenty of my dill pickle deviled eggs leading up to it), but I did pick up some ham since it was on sale. Okay, and I did gift Jesse with a special dark chocolate bar from The Meadow, but that’s the extend of it. We didn’t even eat the ham on Easter, as it was a leftovers kind of night. Up until Saturday afternoon, we actually thought we were getting together with friends on Easter Sunday (not for Easter, but just to get together for dinner), but that ended up falling through. Meanwhile, if you have any leftover Easter ham or picked some up because it was on sale, this recipe is a great way to use it. There’s asparagus, carrot, and dill in the mix too, which yields a lot of spring flavor. 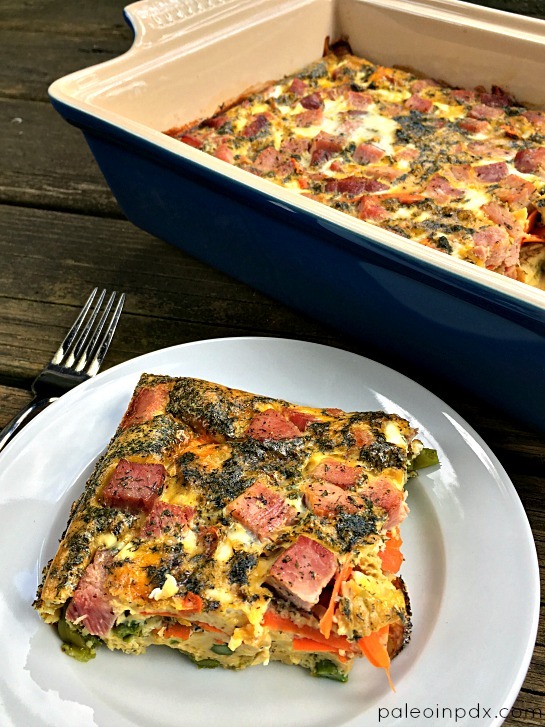 It’s a great recipe to save for Mother’s Day brunch or any spring occasion. Steam asparagus pieces over medium-low heat for about 4-5 minutes. Remove steamer basket from pot and set aside to cool a bit. In a large bowl, beat together the eggs, broth, coconut milk, dried dill, sea salt, and black pepper. Add the steamed asparagus, carrot strips, and ham cubes to a 9×13 baking dish and distribute evenly (note: depending on the pan you use, you may need to grease it with a little butter or coconut oil first). Pour egg mixture on top. Place in preheated oven and bake for 45-50 minutes or until set. Let cool 5-10 minutes before slicing.